4 Hugues Ross - Blog: Update: New Stuff Coming Up! It's been almost 3 months since the last substantial update. My last post explained some of it, but I imagine you might still like to see this place become a little more active. 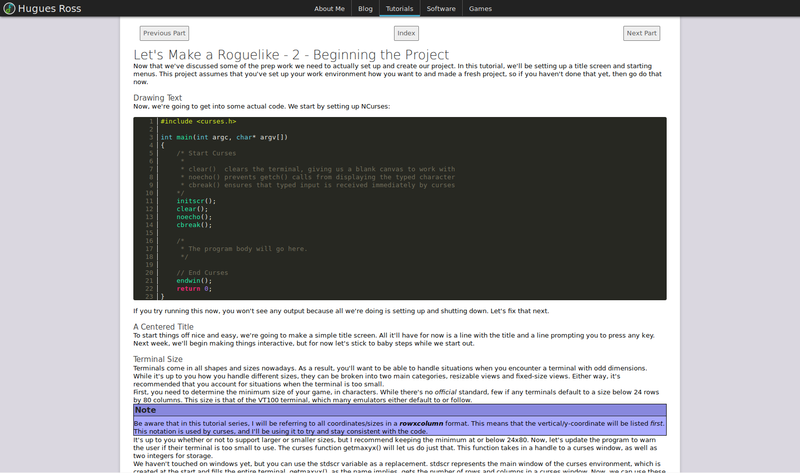 Well, I think it's time for a small announcement: I will soon be restarting my roguelike tutorial! The tutorial will be moving to its own dedicated section of the site, and I'll also be releasing a bunch of small tweaks and improvements to the site's design. The current plan is to start things up again on December 19th, with new updates coming every other Monday after that. Nothing here is final, and the text is unedited. However, I think it still does a good job showing off some of the changes. I'll be sure to give a full rundown when the time comes.